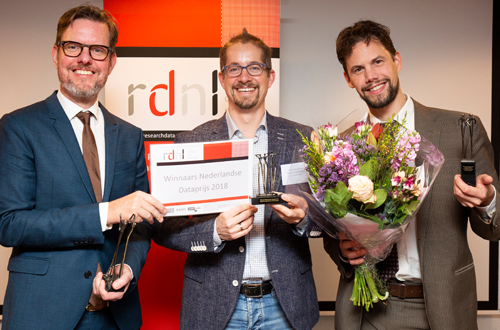 LUMC researcher Bas Heijmans received the Dutch Data Prize 2018 on behalf of the BBMRI-Omics partners on Wednesday 28 November from the hands of Stan Gielen, NWO and the jury chairman of the Data Prize 2018. In BBMRI-Omics researchers from all over the Netherlands have brought together large-scale molecular data to map disease processes of common illnesses more quickly. The globally unique collection is publicly available through the Biobanking and BioMolecular Resources Research Infrastructure (BBMRI). ‘It is a unique collaboration between the Dutch research centers with biobanks’ and ‘the dataset gives a new dimension to the use of data in medical science’, according to the jury of the Dutch Data Prize 2018 in its report. BBMRI-omics became the winner in the category ‘medical and life sciences’. The initiators received a sculpture and € 5,000 to spend on making their dataset even more accessible. The jury warmly welcomes this initiative. What makes molecular omics research so very special is that it simultaneously studies the structure ánd activity of all genes in our DNA in large biobanks where thousands of people voluntarily make data available. In this way processes of disease and health can be unraveled down to the smallest detail. This has already resulted in dozens of scientific publications that step by step bring closer the targeted prevention and treatment of diseases such as digestive diseases and cardiovascular diseases. With BBMRI-Omics, Dutch researchers have also built up expertise that is necessary for the future of molecular big data research. For example, the omics data will now be integrated with MRI and medication data. With this knowledge, the path to tailor-made healthcare (personalized medicine) is becoming shorter and shorter. For more information about BBMRI-Omics and access to the data, see the special Omics page on this website.